DEPARTMENT OF BIOTECHNOLOGY (DBT) invites applications from students in biotechnology/ bioinformatics for hands on training in biotech companies for a period of six months. Stipend of Rs.10,000/- p.m. will be paid to selected candidates. 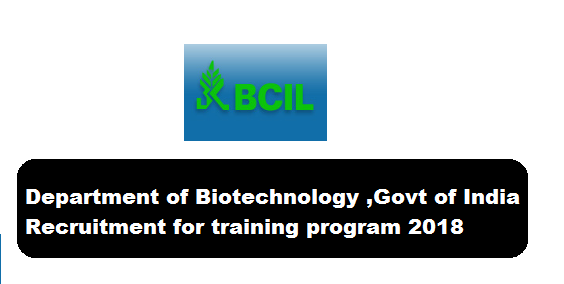 The programme is being implemented by BIOTECH CONSORTIUM INDIA LIMITED (BCIL). The objective of BITP-NES is to provide an opportunity for Biotech/ Bioinformatics students to acquire practical skills and experience working on projects alongside industry experts as well as to provide an opportunity for the industry to identify potential employees. Candidates must have done B.E/ B.Tech./ M.Sc./ M.Tech./ M.V.Sc./ MBA in Biotechnology/ Bioinformatics from recognized universities in North Eastern States or with domicile of North Eastern States. The application form is available at http://www.bcil.nic.in/BITP_NER.htm.The following documents are to be sent to Mr. Manoj Gupta, Manager, Biotech Consortium India Limited, 5th floor, Anuvrat Bhawan, 210, Deen Dayal Upadhyaya Marg, New Delhi-110002. b) A demand draft of Rs.250/- in favour of “Biotech Consortium India Limited, New Delhi” towards non-refundable application fee. Please write your Name, date of birth and mobile no. on the reverse side of demand draft. c) Self-attested photocopy of proof of domicile of North Eastern State. d) Self-attested photocopies of degree/final marks sheet of highest qualification.